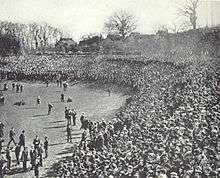 The 1901 FA Cup Final was played at Crystal Palace between Tottenham Hotspur and Sheffield United—and the first FA Cup Final to be filmed by Pathé News. The win was the first in a trend (which continued throughout the twentieth century) of Tottenham winning major trophies in years ending in "1". 110,820 supporters attended the match to see the two sides clash. Fred Priest opened the scoring for Sheffield United after about 20 minutes. Sandy Brown headed an equalising goal shortly afterwards and half time arrived with the score 1–1. Brown put Spurs ahead early in the second half, but, not to be denied, Sheffield United pressed strongly, and Walter Bennett headed an equaliser for the draw. In the replay, Spurs became the only non-league side to win the FA Cup when they beat Sheffield United 3–1 before an attendance of 20,470 at Burnden Park, Bolton. John Cameron opened the scoring before centre forward Sandy Brown became the first player to score in every round. He netted both goals in the final as well as one in the replay for a total of 15 in the season's competition. Wikimedia Commons has media related to 1901 FA Cup Final.